ClubCoins Nødvendigt: 71 Please note that, for now, you cannot download content from our platform directly onto a mobile device (phone, iPod, iPad, tablets...). You need to download your items onto a PC or Mac, and then transfer them onto your device in the normal way. We are working on allowing direct downloads to mobile devices but this is not possible in the current version of the platform. Sorry about the inconvenience! NOTICE: Requires the base game Stellaris in order to play. Activation key must be used on a valid Steam account. 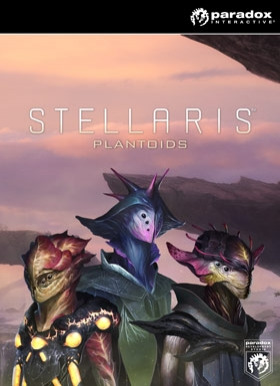 Requires internet connection.About the game	Plantoids is the first major DLC package for Stellaris, Paradox Development Studio’s science fiction grand strategy game. It is the first Species Pack, introducing a new phenotype for players with original art and animations. As the titl… e implies, Plantoids will give Stellaris fans access to a plant-like species that has gained sentience and begun to spread its tendrils across the galaxy, planting the roots of new civilizations on new planets.Key Features Fifteen new species portraits New templates for plantoid civilian and military ships New cityscape art System Requirements	Windows - Minimum Operating system: Windows 7 x86 /Windows 8 or newer Processor: Intel® Core 2 Quad 9400 @ 6.66 Ghz or AMD Athlon II X4 640 @ 3.0 Ghz Memory: 2 GB RAM Hard disk space: 4 GB HD Space Video: NVIDIA® GeForce X 460 or AMD HD 5770 with 1024MB RAM video memory required, shader model 3 required. Lastest WHQL drivers from both manufacturers. Sound: Direct X- compatible soundcard DirectX®: 9.0c Controller support: 3-button mouse, keyboard Special Multiplayer Requirements: Internet Connection or LAN for Multiplayer Windows - Recommended OS: Windows 7 x64 or newer Processor: AMD Phenom II X4 850 @ 3.3 Ghz or Intel i3 2100 @ 3.1 Ghz Memory: 4 GB RAM Graphics: AMD HD 6850 or Nvidia GTX 560TI with 1024MB VRAM. Latest available WHQL drivers from both manufacturers DirectX: 9.0c Storage: 4 GB available space Sound Card: DirectX 9.0c-compatible sound card Controller support: 3-button mouse, keyboard and speakers Special multiplayer requirements: Internet Connection or LAN for multiplayer	Mac - Minimum OS: OS X 10.8.5 or newer Processor: Intel Core i5 @ 2.5Ghz Memory: 4 GB RAM Graphics: ATI Radeon HD 6750 / NVIDIA GeForce 320 or higher with 1024MB VRAM Storage: 4 GB available space Controller support: 3-button mouse, keyboard and speakers Special multiplayer requirements: Internet Connection or LAN for multiplayer	Mac - Recommended OS: OS X 10.11 or newer Processor: Intel Core i5 @ 2.9Ghz Memory: 4 GB RAM Graphics: Nvidia GTX 750M or AMD R9 390M with 1024 VRAM Storage: 4 GB available space Controller support: 3-button mouse, keyboard and speakers Special multiplayer requirements: Internet Connection or LAN for multiplayer Linux - Minimum OS: Ubuntu 14.04 x86 Processor: AMD Athlon II X4 640 @ 3.0 Ghz or Intel Core 2 Quad 9400 @ 2.66 Ghz Memory: 2 GB RAM Graphics: AMD HD 5770 or Nvidia GTX 460 with 1024MB VRAM. Latest available proprietary drivers from both manufacturers. Storage: 4 GB available space Controller support: 3-button mouse, keyboard and speakers Special multiplayer requirements: Internet Connection or LAN for multiplayer	Linux - Recommended OS: Ubuntu 14.04 x64 Processor: AMD Phenom II X4 850 @ 3.3 Ghz or Intel i3 2100 @ 3.1 Ghz Memory: 4 GB RAM Graphics: AMD HD 6850 or Nvidia GTX 560TI with 1024MB VRAM. Latest available proprietary drivers from both manufacturers. Storage: 4 GB available space Controller support: 3-button mouse, keyboard and speakers Special multiplayer requirements: Internet Connection or LAN for multiplayer © 2016 Paradox Interactive®. Trademarks belong to their respective owners. All rights reserved.